As a mom who's back to full time corporate employment, it's my everyday struggle to perfect a balancing act between career and family life. If I don't pull myself together, reflect, and prioritize, I can literally be all over the place, with so many (need and want) to-do-things on my plate. I did experience being a stay at home mom. And since I'm back to the workforce, I can more or less compare and contrast the beauty of each. Truthfully, either way... to each his own. Hah. ;-D As always, the silver lining is such that at the end of every stressful day, I have my ever dearest family to go home to. I get my fill and refills of power hugs and kisses from them. With a growing demand for supermoms nowadays ^_^, it's important to keep myself in tip-top shape. Being always on the go requires good physical health and stamina. Having strong bones and joints ensure that you can enjoy more one-of-a-kind adventures with family and friends. For aspiring supermom like yours truly, Anlene Total is a good way to start and to end your day right! Bone Nutrition Expert Introduces its newest formula, ANLENE TOTAL! For as long as I can remember, I've been made to see, to experience, and to realize the goodness of milk. My parents instilled in me the habit of drinking milk, even in college. Even now, my hubby also persistently reminds me to take my daily dose of calcium, be it in milk or supplements. So it's doubly nice to know that Anlene has a TOTAL tagline attached with it now. From a consumer standpoint, anything with "TOTAL", be it a toothpaste, a mouthwash or what have you, is synonymous to more time and cost savings because with reinforced benefits, you don't need to take an extra step or to pay more. Through the efforts of Fonterra, maker of Anlene, bone health awareness continues to be significantly relevant and the role of high-calcium milk in Osteoporosis prevention is clearly established. However, many Filipinos may not realize that joints too, experience daily wear and tear. Joints provide the lubrication between two moving bones. However, the joint cartilage which protects the ends of our bones can wear out. 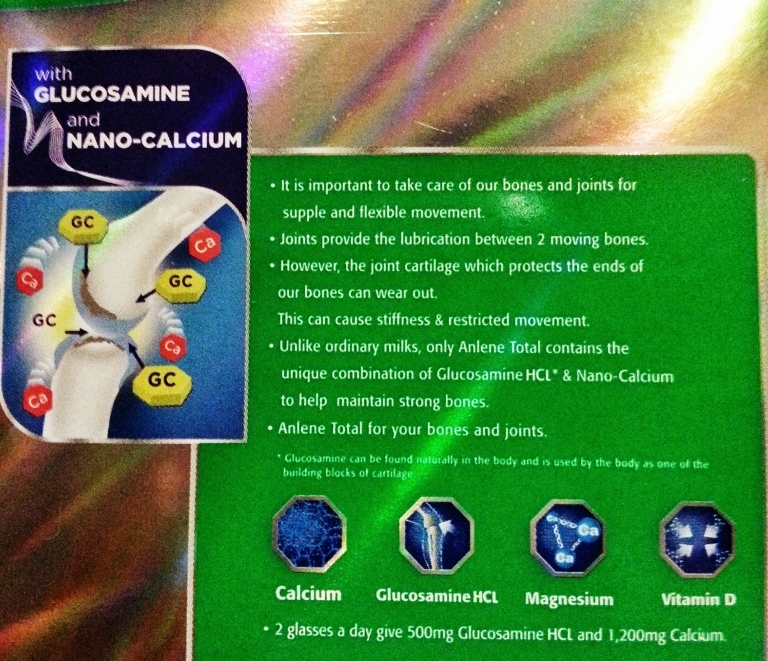 Glucosamine, an essential building block of joint cartilage, is naturally found in the body. It is produced by the body but the ability to do so is reduced with age. With this, even everyday pressure from usual activities like walking, climbing up and down the stairs, may cause degeneration of joints or Osteoarthritis. 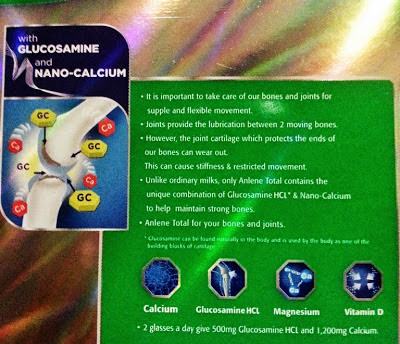 Anlene Total with reinforced benefits of Gluosamine and Nano-Calcium. Got milk? 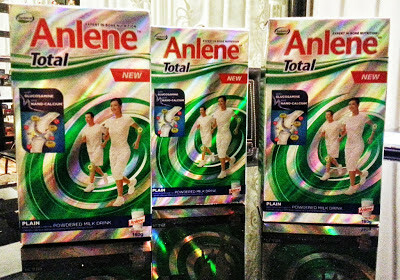 Try Anlene Total now. For more details, please like Anlene Philippines Official FB Page, you can share your before and after experience or changes after fitting in Anlene Total in your lifestyle. Tweet away! Follow Anlene on Twitter @AnleneTotalPh. Fonterra is a global cooperative with its roots firmly planted in New Zealand’s rich land, working to unlock every drop of goodness from the 22 billion liters of milk it collects each year and sharing it with the world. With its vision to be the natural source of dairy nutrition for everybody, everywhere, everyday. With generations of expertise behind Fonterra, they've grown to be at the forefront of dairy innovation providing more value to consumers and it will be for the generations to come. Fonterra aims to add real value for everyone throughout their lives through our various offerings. Today, Fonterra Brands Philippines is one of the leading fast-moving consumer goods companies in the country and proud of its role in bringing the best quality dairy products to the Filipino consumer. Fonterra carries three major brands under its portfolio, Anlene, Anchor and Anmum. They also offer premium cheese brands, Perfect Italiano and Mainland. Fonterra has worked with the International Osteoporosis Foundation (IOF) since 2007 and has been IOF’s Regional Nutrition Partner in Asia-Pacific since 2010. The partnership is based on a shared vision to increase bone health awareness and education in the Asia Pacific and Middle East regions. Anchor is an iconic New Zealand brand, known for quality milk and dairy innovation; and Anmum is the no. 1 maternal milk in the Philippines. The Foodservice business, supplying to hotels, restaurants, caterers, industrial and quick serve accounts, has been continuously growing as Fonterra becomes the product of choice because of its value and quality. Disclaimer: Benefits as quoted, and as shown on the box were provided by Fonterra. Company and Brand profile are also provided as part of press release.